I'm loving the Bird scooters so much. If you stand in the center of the village you can see people crisscrossing and going in all directions. I've noticed that a lot of people use it to grab lunch. They order first, then use the scooter to scoot down the block and pick up the lunch. It takes them a few minutes. This construction worker did that. He whizzed by going west and then a few minutes later came back with a bag of food in his hands He was so fast that I couldn't get a better photo of him. I've seen many others do the same thing. 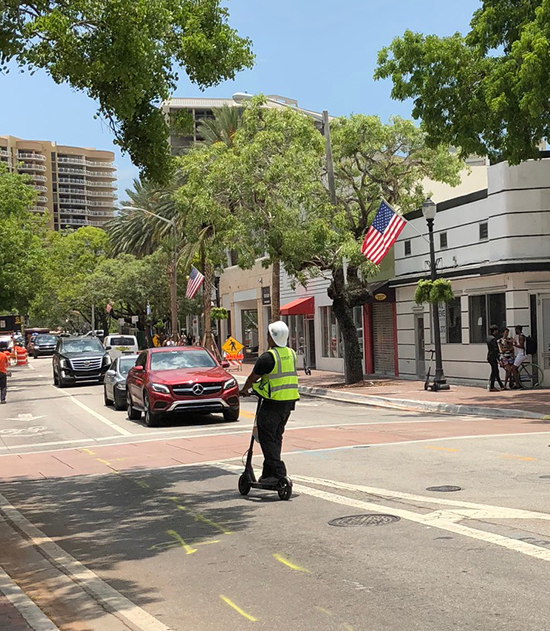 They aren't just trying the scooters out, they are using them to get around and to get lunch. Recently one or two of the parking garages raised their daily rates from $6.00 to $21.00. I think this is to keep all the construction people out who arrive early and take up all the spaces. I remember there being talk at a meeting not too long ago about having the construction workers park in empty lots in the Village West, many which are owned by the same people building in the Center Grove. I'm thinking with these scooters, that's how they can get around. Workers can park their cars down on Grand Avenue and then scoot to the construction site. I saw some guys on OneWheel electric skateboards recently. Are those going to start popping up around here, too? You're aware that the photo of the guy on the scooter represents an illegal use of this scooter on a public streets, aren't you?